Earthquakes, tsunamis, floods and droughts: when a natural disaster strikes, relief organisations react by providing medical treatment, food, water and shelter. However, in these difficult and chaotic circumstances mistakes are inevitably made and supply networks often prove to be insufficiently resilient. How can we get better at this? How can critical infrastructures like national rail networks bounce back more quickly in the aftermath of a disaster? How can we make sure we are moving the right products and services to the right places? 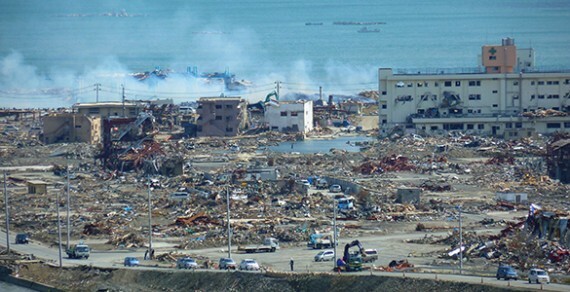 Disaster Operations Management is becoming an increasing focus of global research. Senior Research Associate Dr Tariq Masood and colleagues from the IfM’s Distributed Information and Automation Laboratory (DIAL) recently organised a five-day international workshop in Cambridge as part of the Disaster Resilient Supply Chain Operations in South Asia (DROPS) project. The workshop brought together two different sets of expertise: senior practitioners, government officials and academics involved in disaster preparedness, mitigation and relief together with specialists in supply chain operations, resilience and big data analytics. Among the experts at the workshop was the former Chairman of the national organisation for disaster relief in Pakistan; an Additional Secretary of the Finance Ministry in Pakistan, which is also responsible for creating and managing the newly established $3 billion National Disaster Risk Management Fund (NDRMF); and heads of two big data organisations working in South Asian countries. The group looked at mapping disaster relief supply chains, developing resilience frameworks, understanding how big data analytics can support DROPS and constructing disaster scenarios. They considered case studies and lessons learnt from natural and disease-related disasters and supply chain operations mainly in Pakistan, Nepal, Bangladesh, Sri Lanka, India, New Zealand and the USA. Using this evidence, they developed a framework for designing resilient supply chains for disaster relief operations in a variety of disruption scenarios to underpin future investments for sustainable economic development. A second workshop has been held in Lahore earlier this year, funded by industry in Pakistan, with the delegates keen to implement the findings from this project. The NDRMF is also planning to incorporate the DROPS framework in order to increase the resilience of their future projects. This project was funded by an EPSRC Global Challenges Research Fund Institutional Grant, in collaboration with the Cambridge Engineering Design Centre and Department of Architecture.